Origin: South American Amazon Region. Temperament: Very peaceful in nature. Company: Preferably in schools of 3, but do best in schools of at least 6. They can be kept with any peaceful community fish. Aquarium Setup: Smooth substrate, with non jagged edges. Feeding: C. Aeneus will feed upon any small bits of flake that fall to the bottom of the aquarium, some algaes, and their diet can be supplemented with sinking shrimp pellets. Breeding: Eggs are lain, but are usually eaten soon after. If fry is desireable, the eggs should be removed and transferred to a separate tank/egg tumbler. 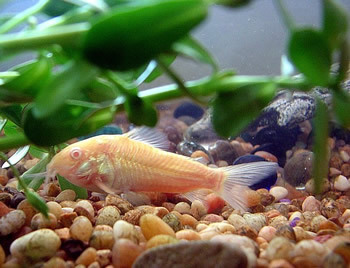 Picture of Albino Cory - Corydora Aeneus.